I am quite behind on blogging! I have been looking for a full time job. I have two interviews set up for next week. In addition, I have taken on a second freelance job. Also, and this is crucial, every time that I'm near my computer that my son is awake, I have to look at penguins. I have a lot of new links for my new penguin fan readers. But in this post I am going to try to catch up on blogging my cooking. Last weekend our family had dinner together, just the three of us, and then we had a bunch of friends to the house for lunch. I baked challah and it was incredibly good and I was not too exhausted to do it and also cook. I am getting into making the pull-apart yud beis loaves. This week I think I'm going to skip baking because it's so hot and I have to get a haircut tomorrow morning so I'll be presentable at my job interviews. The exciting thing in last week's cooking was making a stuffed zucchini recipe from Fresh from the Vegetarian Slow Cooker. I borrowed the cookbook because I know that my readers are all having the same problems I am making vegetarian (and even omnivorous) cholent. I want to test a lot of the recipes and ideas so I can report back. I tested out this recipe for zukes stuffed with chipotle rice. The recipe was excellent--I mean the rice stuffing was nicely spiced and tasty-- and the cooker worked pretty well. You don't add liquid and the zucchinis sweat water into the pot. My cooker is a bit slow and I also stacked two layers of zukes. I think I need some practice. I also made a very nice cold spinach soup. I also made Kasha Varnishkas, which everyone, but especially my toddler, loves. It's very hot here. In meal planning terms, it's cold soup weather. In order to bake challah and not sweat buckets in our apartment, I made challah on Thursday evening. I had great success with my yud-beis pull-apart loaf. This time I used a smaller pan, a 9" layer cake pan with lower sides. I used parchment paper and greased the sides. I didn't overbrown the bottom and it looked gorgeous. My son helped me make the dough so there were lots of raisins in every loaf. This even though he also ate the raisins out of the dough as he went along. My husband and my son went out on an errand right before dinner time. My son was pretty hungry when he arrived. He stood up on a kitchen chair in front of the salad bowl and ate most of the orange sections and some of the pepper slices and cucumber pieces out of the salad bowl. I didn't stop him. Should I stop him from eating fruits and vegetables? Are you fainting with envy, my sisters in mothering two-year-olds? In fact I was happy, I don't really like red bell pepper. I only bought the outrageously expensive organically grown thing because I know he likes them. Peel or pare and chop all vegetables and put it all into a food processor. Purée until very smooth. Transfer to a bowl that has a good cover. Add enough water to make the right consistency and taste for sourness. It should look and taste like it was made with whole milk yogurt. Boil the lentils in plenty of water until they are soft but not mushy. This could take 20-30 minutes on the boil, depending on the age of the lentils. Drain them and put them into a bowl. Add the oil, garlic, coriander, salt and pepper while the lentils are still warm. Stir and let cool just a little. Then add the vinegar, orange pieces and cilantro. I didn't have a fresh pomegranate for the spinach salad, and one of my guests is allergic to nuts, so I changed the dressing slightly. I added pomegranate molasses to the oil and vinegar, and also dried pomegranate seeds from the Indian food store. I let the seeds sit in the dressing overnight before I poured it over the salad. It was pretty credible. I didn't wash the spinach enough and it was embarassingly gritty. I haven't made that mistake in many years. Luckily our only guests were our very close friends, a couple that we have decided should be our son's guardians in our will. We talked about serious health stuff, also about dealing with our moms, but there was also a lot of joking. I am so happy we have them in our lives. She's the person whose picture should illustrate the word "integrity" in the dictionary. I think his word might be "focus" but I'm not sure. Anyway they are coming back tomorrow after yoga class to help us clean our apartment. They have given us a lot of help with this place in the last weeks, it provides me with an excellent pretext to invite them for many meals. I was going to invite some new people from schul but felt exhausted by the heat. Some excuse! You know you are doing something right when your Jewish communityfaces a problem making a minyan every year on the day of Gay Pride. Yes! Readers! My toddler eats vegetables and my Jewish community is welcoming to gay people! My apartment is not clean but my life is very good! I didn't post any meals for last week. We went out of town to my mother-in-law's house. I did bake a challah to bring to her, but I didn't do any cooking. I didn't even make a salad! My mother-in-law is a great cook, she makes plain but tasty vegetarian food. She always makes the salad in the mode of Adele Davis, dressing the greens with oil and lemon and putting some spice blend on them. One thing that was super about this meal was the challah. I made two batches by hand simultaneously--meaning I had two bowls going. I let my son put raisins in one of the doughs. He measured out a full cup of yellow raisins and then added some more! When I made the loaves, I decided that one should be a "yud-beis" challah--a pull-apart challah with 12 sections. I made each section out of a knotted roll. It looked like a crown. Another thing that was good was providing beets for my mom and brussel sprouts for my dad. They were both really happy to have a vegetable they each like but don't each much at home. The beets recipe is one my mother-in-law makes that my son liked a lot. My dad is a big fan of puréed potato soups, this one was just very slightly golden from the carrots. It was very creamy and I didn't need to add any soy or rice milk to make it flow. It's very hard to cook for my mom, because 1) she's always on a diet and 2) she likes to express her disapproval frequently, and this extends to not liking food I've made. But I am most grateful to say, it does not extend to my son, who is the apple of her eye. Both of my parents are completely wonderful grandparents. They are generous with gifts and with time and with love. My son figured out that they would each read to him if he asked, and kept walking books over to them. I tried to make sorbet in my ice cream maker, and wound up sticking the whole bowl of the ice cream maker back in the freezer full of slush. I didn't have to mix anything together, I just took a relatively sweet bottled mango juice and poured three cups of it into the device. So it wasn't like I lost much effort there. The slush finally froze and we are eating it slowly now that Shabbat is over. I have been making the challah recipe in Peter Reinhart's The Bread Baker's Apprentice for a few months now. I finally feel that I have made enough changes to his recipe to call this my own variation. I made it this past week with both honey and sugar. My husband thinks maybe the one with all honey is better. If you want to try that, add 6 tablespoons honey to the wet ingredients and omit the sugar all together. Put the dry ingredients in your mixing bowl. I have been using a Kitchen Aid mixer because it makes it easier to do this with a two-year-old helper! Mix the dry ingredients together briefly, then gradually mix in the wet ingredients. When the two parts are full incorporated, knead the dough. I do this by switching from the mixing to the dough hook attachment of the mixer. I let the Kitchen Aid knead the dough for 6 minutes at medium speed, but then I generally also turn it out onto the tabletop to knead a bit by hand to make sure it's really right. I do the windowpane test--I stretch a piece of dough between my fingers to see if it will make a translucent window--to check that the gluten has developed. I put the dough in a well-oiled bowl and cover the top with purple plastic wrap. Let the dough rise for an hour and then knead it for a couple of minutes. Then put it back in the bowl and let it rise until doubled. I wet my finger and insert it in the dough to see if the indentation fills in. When it does not, I know it's doubled. Divide the dough into nine balls. Let the balls rest 10 minutes. (This step is part of the special secret baker's knowledge a person gains from Peter Reinhart, who is the man! I have to put the balls on a baking tray and put the tray out of the reach of the baby.) Roll each ball into a snake and then braid three snakes together per loaf. Put the loaves on the pans of your choice on top of some parchment paper. Brush the loaves with egg white and then spray them with oil with your Misto, and cover them with plastic wrap or a linen dishtowel. Let them rise until they are quite big, maybe another hour? Preheat the oven to 375. Then remove the covers, brush them with egg white again and sprinkle with sesame seeds. Bake 20 minutes and then switch the loaves around in the oven. Then bake another 15 minutes or so, or until the loaves sound hollow when tapped. My son went through a phase of tapping all baked goods because of seeing me tapping the challah! He still likes to tap the challah. This past week he woke from his nap and said "Loaves! Tap tap!" and tapped them. He knows a lot about baking bread, thanks to helping me bake and to reading the Reinhart book with me and looking at the photos. Isn't this exciting! I have photographs! This is a picture of the Pane Siciliano from The Bread Baker's Apprentice that I decided to make this past week. I need to use up all the different kinds of flour in the house before Pesach. That was my excuse! Doesn't it look great? It's a great recipe. If you have the book, you will recognize it from the back cover. If you don't, I know you are going online to your public library right now and asking them to reserve it! The recipe calls for a pre-ferment dough, you actually make a full-fledged French bread dough called a paté fermentée the night before you make the full dough. I made my hamantashen dough and the pre-ferment dough with my son on Wednesday evening. He loves to make dough. He stands on a step stool next to the kitchen table where I cook and says "Dough! Dough! Dough!" and wants to help put ingredients in the bowl. On this evening, I set out all the ingredients and the doorbell rang. I went to answer the door because our apartment is small and I figured I could see him down the hallway. During the time I was getting the door, he dumped almost the entire box of baking soda into the (fortunately) empty mixing bowl of the Kitchen-Aid. It was pretty funny! I put the baking soda into a plastic container, cleaned the bowl and we kept going. Now I have to complain. Everything in these two meals came out very well except the chickpea soup, that same soup that was so incredible the last time I made it. Like many people, I have trouble getting beans to cook in a slow cooker. This time, I soaked the beans, but not for as many hours as the last time, so they didn't cook fully. I do start the soup cooking on "high" for a few hours before Shabbat, but this was not sufficient. I try to make sure that there is at least one hot thing at my Saturday lunch table, in honor of the principle of having a hot meal on Shabbat. But I can't put out a hot plate because there is no surface my two year old can't reach, and anyway we have very few electrical outlets. Our stove is gas and the burners sometimes spontaneously go out, so I don't put a blech (a metal sheet you stick on top of the stove) on top, and our oven automatically shuts off after a few hours. That leaves the crockpot. Soon it will be too hot for a hot dish to be appetizing, so it won't be an issue. After Shabbat I simmered the beans in a pot on the stove for a long time, and my son and I ate them for lunch on Monday and Tuesday. He is way into chickpeas. Our Saturday lunch guest brought a salad with lettuce, fennel, parsley and blood oranges, dressed with some special olive oil. She is a wonderful cook and a raconteuse. She's another one of my peeps that I feel like I never see. She brought me some novels to read, which I unfortunately finished by the end of the weekend. One of them was The White by Deborah Larsen. It's a historical novel that was based largely on a single memoir, which I mean to read. I think I have a huge gap in my education because public schools in the United States teach almost nothing about American Indians. I read Lies My Teacher Told Me finally this year and have been confronting the implications of it for some months. This week I'm going to a wedding in Philadelphia so I won't be cooking. Catch you later! This past Wednesday was my husband's birthday. I wanted to make a cake, but I knew that he was going to be out tutoring bar mitzvah students in the evening, so we instead invited people to our house for Shabbat lunch. Our friends decided to make us lunch. (We almost never go out for Shabbat meals because of our zealous fanaticism about our son's sleep.) So I made Friday night dinner and our friend D. made most Saturday lunch. I contributed the cake, the challah and some soup. Are you noticing that I keep making the same food? I am starting to think that blogging is not good for my creativity. The food was great though. I succeeded with the Reinhart all-white-flour challah again, big time. I liked my braids, I got them fatter in the middle and tapered on the ends. There was none left for making French toast. Our family ate the first loaf and the Saturday lunch guests ate up the second. The kugel I basically invented on the spot, it was very eggy. I had made another recipe (for the cake, below) that called for three egg whites, and the Reinhart challah calls for brushing the tops of the challah with two beaten whites. Of course you never use up the white on the challah, but there is still some left. So I made the kugel with one whole egg, three yolks and what was left of the egg white from the challah--a LOT of egg. I also used a 1lb. package of skinny egg noodles, a 10 oz. package of frozen organic spinach, a chopped carmelized onion, tamari, black pepper, and wheat germ for the top. It was, unsurprisingly, very good, being so rich. I love D.'s salads, they are always so creative and wonderful. He is a great cook. Unfortunately, the strata--a kind of bread pudding-- got burnt, but fortunately, it tasted good anyway. The bananas were not successful--he used red bananas and therefore couldn't tell that they were quite underripe. They were as astringent as unripe persimmons. Let that be a lesson to us all! I made a soup in the crockpot out of black beans, french lentils, sundried tomatoes, carmelized onion, and a small piece of chipotle pepper with some adobo sauce. I also put a piece of kombu (that's kelp) and a dried Chinese mushroom in the water to help give the soup some umami flavor. I know my husband doesn't like mushrooms so I fished it out. I though it was an exceptionally good soup, but it wasn't salty enough. I also made a birthday cake from a recipe in the My Most Favorite Dessert Company cookbook by Doris Schechter. It was fun to make the cake with my electric mixer--in the past I have mainly made cakes by hand, but I have been using the mixer more often lately to make baking easier with my toddler guy. The best part was making an Italian meringue. I set up the eggwhites, started making the sugar syrup--as soon as the syrup was hot, turned on the mixer--and when the syrup was 150 degrees, poured it into the whirling eggwhites. I got meringue everywhere, but it was totally interesting and fun. As enjoyable as it was to make, the cake was disappointing. I saw that Mrs. Schechter usually tells the reader to pour orange syrup over the cake before icing it, but I didn't take the extra step, and the cake was somewhat dry. The icing, which looked beautiful, tasted strongly of the Earth Balance shortening I used to make it. The chocolate, vanilla and sugar in it were not sufficient to drown out the echo of insipid shortening taste, even though I used the wonderful Green and Black's Maya Gold chocolate. It was good cake, just not as good as I had hoped. I actually prefer the vegan chocolate ganache in the Millenium restaurant cookbook, which is just a ton of chocolate melted into soymilk. Soymilk ganache has the best flavor of any frosting, but it's also really melty so you can't frost the cake in advance. Another good non-dairy frosting I have made was in Recipes from an Ecological Kitchen, it was carob, maple syrup and almond butter, whirled in the food processor. It made a glossy and beautiful icing, but was nearly as messy as the gobs of meringue I had to get off of everything. In the end there were nine adults around the table, three of whom came for dessert only. Part of our conversation was about dreams. It was pleasant and relaxed and I felt like some people got to know each other better. The soup was great! It was not very spicy, but it was warming and pleasant. It's supposed to be very spicy. This is the problem with Laurel's Kitchen. Or maybe it's with my leftover-from-Passover ground black pepper? Spicy or not, it was delicious. The kugel was good, it had a crust of wheat germ on the top and bottom which made it extra tasty. I will have to post my recipe now that I have made this common recipe my own. I bought turnips again because the turnip soup was good two weeks ago. I had never eaten a turnip growing up. Had you? This dish was not a success. It was supposed to balance the sharpness of the turnips with an unctuous sweet glaze. Well it was bitter and mushy. Blech. My husband has a thing about how challah should be made with white flour. Generally I abide by this unreasoning prejudice. This week, I ran out of the white bread flour I have been buying every week at Whole Foods, but I still had several bags of whole wheat flour. My poor life partner didn't realize that all those bags of flour were whole wheat! He gave me the go-ahead to make 100% whole grain challah in order to save us some money and a trip to the store. I decided that since the whole wheat bread in The Bread Baker's Apprentice had come out so light, I would use that as a base recipe. This recipe calls for two pre-ferments: a soak and a poolish. 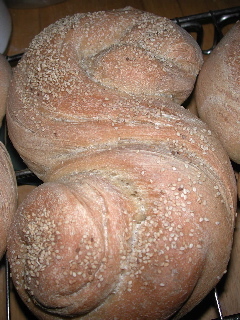 The poolish is a sponge made with flour, water and yeast, and the soak is just flour and water. In order to make the challah taste like challah, I added 5 teaspoons of sugar and two eggs to the recipe, plus some oil. I made a pleasantly sweet whole wheat bread, nice and light, but it didn't ring my challah chimes. It was good, but a little too sweet. I thought the rice pilaf (ginger, sesame and shallots) was good, but my husband was unenthusiastic. The cauliflower was good. We went to a potluck Melavah Malkah on Saturday night. I made a coleslaw of purple cabbage, carrots, scallions and mung bean sprouts, dressed in a sweet sesame dressing from the Moosewood Restaurant New Classics Asian Slaw recipe. I added some canned chickpeas. It didn't get finished, though there wasn't much left. I thought it was pretty good, but maybe people aren't in the mood for coleslaw in the middle of the winter. All together, kind of an off week for me in the kitchen! Next week I will be visiting my parents. Probably I will be doing some cooking. At least I expect to be baking my son's birthday cake. This is the subject of some contention. My skinny husband, who eats dessert with every meal and is a sweets fiend, doesn't want to offer my son sweets until he asks for them. (By name? Who knows.) My mom, who is perpetually dieting and obsessed with her weight, is equally extremely interested in giving my son cake. (She wanted to give him some disgustingly sugary birthday cake at his first birthday, but he was quite satisfied with some delicious--and I'm sure sugar-sweetened-- challah instead.) I feel like I'm caught in the middle. I don't totally know what I think about it. But I'll let you know what kind of cake I wind up baking! May peace and good be renewed in them. On Friday evening we went to a potluck. It was sparsely attended because of the extreme cold, but we came with our toddler and had a good time. I made one of the south Indian rice noodle dishes from Julie Sahni's Classic Indian Vegetarian and Grain Cooking, and added some lightly steamed broccoli. (Another truly excellent cookbook, you cannot go wrong with Julie Sahni. I love the way she tells you to have the pot lid handy in case your mustard seeds spatter when you add them to the oil.) The dish is bright yellow with turmeric, which does great things to broccoli when you add it. It did not do good things to our kitchen table and floor when my husband accidentally spilled the cup of water, turmeric and salt solution I had prepared to go into the dish. So much for the whole mise en place concept! On Saturday I thought we were going to have a few guests, but we had just one. I made the challah from the Peter Reinhart book. The person who gave me the book said that the challah recipe wasn't sweet enough, so I increased the sugar from two to five tablespoons. I was kind of dubious about the instruction to put two whole eggs and two yolks in the dough and then brush the crust with the two egg whites. In general challah comes out best when you brush the top with egg yolk. This time, I guess because of the yolk in the dough, I got the dark shiny crust with just the whites. This is why Peter Reinhart teaches bread baking and I don't. Bo knows challah. I made up the bean soup--it was two cans of organic beans (on sale) about six sliced up sundried tomatoes, a very well carmelized diced onion and a spoonful of Organic Gourmet soup stock zutz, all heated with water in my slow cooker overnight. I steamed the spinach and chopped it and had it ready at room temperature to add to the soup. (You know, so I wouldn't be cooking the spinach in the soup.) The barley was bland and needed lemon and salt. The tofu was great, I baked it in Bragg's Liquid Aminos, sesame oil, lots of freshly grated ginger, and the end of a bottle of Baron de Herzog rosé. (I keep forgetting that I need to measure for blogging.) Of course the Claudia Roden dish was delicious, her recipes are so reliable. We had a great, freewheeling discussion with our guest. She is a seasoned political organizer and we talked about how white people can be allies to people of color in political struggles. One point that she made is that people who know the history of their own oppression are a lot more likely to have empathy for others. I don't know if this is true. It's true of me, I know I can make analogies between Jewish experience and the experiences of other peoples and immediately get what things are like for them. I had that experience while I was cooking for Shabbos, listening to this radio show. (My husband and son were at story hour at the library!) The show was about disappearing languages and featured some people who are trying to save their Native American languages. Some white guy phones in from Western Mass or wherever and gets, I don't know, 15 minutes of airtime to pontificate about Heidegger and stuff, about how language is about communication and it doesn't really matter if you use English or Lakota or Welsh or Tutchone. This after the Tutchone speaker had explained that her parents' generation were forcibly sent to boarding schools as children, schools where they were beaten when they spoke their native language. I guess he wasn't listening, or something. I was yelling at the radio. I kept thinking about Avraham Sutzkever and his work to save the YIVO collections in Vilna. Then of course the woman on the radio, very quietly and not angrily, explained that her mother could tell jokes in Tutchone that could not be explained in English. At that point I started to cry. But of course on Shabbat you have leisure to consider that perhaps yelling at the radio is not the best way of effecting social change. I'll have to let you know if I make any progress in figuring out a better one. If you have any ideas, let me know. Also, our guest brought some dried mango and some salad greens. We adore dried mango in our house. The polenta in squash with seitan was from The Millenium Cookbook pp. 140-141, but I made some changes. I didn't think anyone would be able to eat a whole acorn squash full of polenta and stew, so I just sliced the squashes in half and baked the leftover polenta in a pan to serve later. (What a great leftover that was!) Also, I didn't plan to make this recipe ahead of time, so I didn't have all the vegetables that the book calls for the stew. So I made mine with shallots, leeks, celery, carrots and potatoes, store-bought seitan and fewer spices. If I had realized I was going to start blogging about it, I would have written down exact quantities! I generally find this cookbook, like most restaurant cookbooks, a bit too ongepochket for home cooking, but I didn't have any trouble with this recipe, even though I made changes. I think I'm going to make more stuff from this book. I have been making challah since I'm not working full time. One can buy a nice bakery challah where we live, but it's expensive. This week I made French bread because I have this incredible new baking book on loan for a few weeks, and I want to make as many breads from it as I can. The crusty bread (Pain de Campagne, if you have the book) was so delicious with the creamy soup. For Saturday lunch we had kasha varnishkas and Sesame Carrots on a Bed of Soft Cabbage from Mollie Katzen's Vegetable Heaven. My son likes me to page through Vegetable Heaven with him, there are great pastel drawings of vegetables and he yells out their names. We actually do this with a lot of my cookbooks and it's a great way to find recipes! The sesame carrots were really good. I think he ate more of the cabbage while we were chopping it up than in the finished dish though. I need to post about cooking with a toddler. I would love to see what other people do to involve their children of different ages in cooking. Also, I want to know how people who work outside the home and have kids get to cook at all! Maybe you don't! I know some families have a tradition of pizza for Friday night dinner. Hey, if you're relaxing with your family, it's all good! Our guest this past Friday is practically family to us, and we had a lot of enjoyment getting to be with her after too long of not getting to see her.